"Formidable Beast". What better way to toast the fall than to have a bottle of this formidable, dual character brew. At first smooth with mellow overtones of sweet berry fruit, a bite of bitterness suddenly cuts through, long, deep and lingering. Brewed with Rye Malt, it is naturally "blood red" in colour. Unlike the mythical wolf-like creature said to roam the bleak moorland surrounding Newcastle, this is real, so consider yourself warned!" This offering pours a copper in colour. One finger of slightly off-white head dissipates quickly. Filtered and clear of any hop haze or particles. Decent amount of evevesance. Malty nose. Some leathery notes. Slight earthiness. Nothing too over powering. Light in flavour. Minimal sweet berry flavour that leaves quickly for a slight bitterness with earthy finish. Hint of a metallic flavour. Nothing overly exciting. This was less than spectacular. The flavours were not very well balanced or pleasant. While a step up from most macro brands, this is underwelming. A very light ale that is nothing of note. I would give it a "C-" . 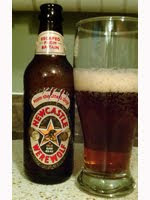 *This beer was provided by Newcastle as a sample for review.